MOSCOW, January 28. /TASS/. Specialists of Russia’s civil nuclear power corporation Rosatom have started testing accident-tolerant fuel for nuclear reactors of the Russian and foreign design, the press office of Rosatom’s subsidiary TVEL said in a statement on Monday. Accident-tolerant fuel is resistant to severe accidents at nuclear power plants. It is expected to keep its integrity for a long enough time without a zirconium-steam reaction that induces hydrogen release. "First Russian-made experimental nuclear fuel assemblies based on accident-tolerant fuel (ATF) have been loaded for testing into the water loops of the MIR research reactor at the State Research Institute of Atomic Reactors [part of Rosatom’s research division This work is a part of the project of Rosatom’s TVEL Fuel Company to develop Russian accident-tolerant fuel resistant to severe beyond-design basis accidents, and bring it to the market," the statement says. 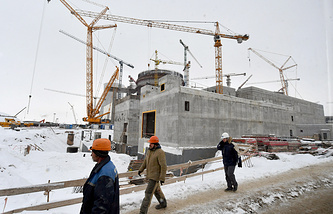 The first phase of the reactor tests and post-reactor studies of accident-tolerant fuel will be completed in 2019. Based on the data obtained, it will be necessary to select the optimal combination of cladding materials, calculate and validate the neutron-physical characteristics of light water reactor cores, TVEL said. The next important stage includes loading experimental fuel assemblies with some ATF fuel rods into a commercial power reactor in Russia, the TVEL press office said. "ATF is of critical importance for further improving the integral safety and reliability of nuclear power," the statement says. Rosatom’s TVEL Fuel Company incorporates enterprises for the fabrication of nuclear fuel, the conversion and enrichment of uranium, the production of gas centrifuges, as well as research and design organizations. The company is the sole supplier of nuclear fuel for Russian nuclear power plants. TVEL provides nuclear fuel for 72 power reactors in 14 countries, research reactors in eight countries, as well as transport reactors of the Russian nuclear fleet. Every sixth power reactor in the world operates on fuel manufactured by TVEL, according to the data posted on TVEL’s website.